It has been a while, but I wanted to catch you up on my travels! My travels the past year covered a wide variety of destinations, both domestic and international, and included some unexpected events such as experiencing a major earthquake in Nepal! But, more about that later….Let’s start off with my report on a truly World Class destination…. Prior to our scheduled SPT South Africa group trip this July, I flew down to Capetown in early November of 2014 for a combination vacation/inspection tour. This is a once-in-a-lifetime destination that is worth every dollar spent. For those of you who could not join the group, the trip can still be done on a private basis, for a small additional cost. The exchange rate on the Rand vs the U.S. dollar is very favorable right now and if this is a destination you have dreamed about, give me a call (800 655 0222 x 802) or shoot me an email (Brenda@maximours.com) and we will come up with a package that is within your budget. Capetown requires 3 or 4 nights to cover the highlights. This is an ethnically varied, sophisticated, fun loving city that charms you at every corner. And one of the most beautiful cities in the world to boot! We spent our first day with a local guide doing what is called “The Walking Eats Tours.” More than food, it covers local history as well. We started off in the old Dutch section of town with its colorful brightly painted houses, which was an early identification method, before there were numbered houses. From there we strolled through the ethnic neighborhoods, munching on refreshing fruit drinks, Arab & Malaysian street treats, with funny names like boobootie and bunny chow, and eventually worked our way to an Indian spice store where we inhaled large vats of aromatic spices. As we gathered up little packets of spices to bring to friends and family back home, the store owner handed us sheets of recipes to go with the spices. Our next stop was the local open air handicraft markets, where drummers and dancers, many of them little children, amazed us with their stamina and dancing skill. Our most poignant stop was a visit to the small, but immensely powerful, District 6 Museum that tells the story of a racially and culturally mixed community, including white South Africans, that lived in harmony until the Apartheid government razed the neighborhood to the ground. Some 60,000 residents were forcibly removed from their homes. Original residents of this community still gather at the museum. If you visit there, take the time to speak with them. Eventually our feet gave out, and after 4 or 5 hours of walking, we circled back to the car, stopping in the unusual unique art galleries along the way. The tour can be done by moving the car from place to place, but we chose to walk it all the way. That evening we enjoyed a delicious seafood dinner on the Waterfront, accompanied by an excellent South African wine and some great people watching. The hotel scene in Capetown runs a broad spectrum, there is something to suit every budget and taste. Our next day was spent touring the Capetown Peninsula, a marvelous day, visiting lighthouses, beaches and the Magellenic penguin colony, whose inhabitants were happy to pose for our cameras as we strolled the boardwalk alongside them. Other day trips include a full day to the nearby wine country, where parents can sample wines while the kids sample chocolates. You can combine that with a visit to a nearby Cheetah Sanctuary, making this a perfect family day. 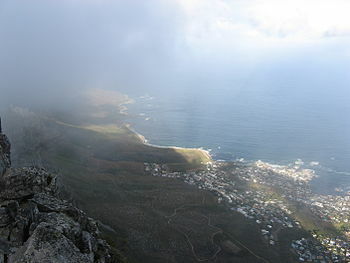 Don’t forget to explore Table Mountain, looming overhead with its blanket of clouds known locally as the “tablecloth.” A full day is also needed to visit nearby Robbens Island, where Nelson Mandela spent many years in prison. Following our Capetown visit, we flew to Kruger for our eagerly awaited safari. There are safari camps and lodges of all variations and costs, ranging from simple comfortable tent accommodations with private bath to luxurious lodges. All of them will provide outstanding animal viewing and a unique experience in the Bush. The schedule is the same in each place, early morning game driver followed by an afternoon rest at the lodge, and then a late afternoon game drive. We were fortunate to see all the animals we yearned to see –giraffes, a pack of lions voraciously consuming a kill, a herd of elephants trumpeting to each other while they grazed, rhino mommies with their babies, hippos basking in the waters, even some baby lion cubs who were curious enough to approach our safari vehicle. But the piece de resistance was tracking a beautiful pregnant cheetah through the bush. To watch a big cat in the wild is truly a lifetime experience. On the long long flight home, rather than the direct flight from Johannesburg to Washington DC, we chose to route ourselves through Frankfurt and spend a few hours with my son, who resides in Stuttgart, having an early morning breakfast with him, before hopping on the nonstop Frankfurt to Denver flight. It was delightful to see him, but to get there, we had to change planes in Lagos, Nigeria, which is not a connection I recommend. This is a very confusing exceptionally busy airport with poor signage and it was one of the most stressful airport connections I ever encountered. Despite that negative, our luggage arrived promptly in Denver airport, after 5 flights getting home. And that is what I call Great Luggage Karma. On the way home we overnighted at the historic Hotel Albuquerque in Old Town Albuquerque. This is a fun overnight stop and a nice family friendly charming hotel. There is plenty of Native American handicraft shopping and lovely little restaurants including the Church Street Café, behind the church, converted from a former spacious hacienda. On another note, last July we attended the Santa Fe Opera for a performance of Carmen. Although this is not an activity suitable for young children, it is an event unique unto itself and a lovely way to introduce older children to the opera. The setting is magnificent, overlooking the mountains, and the evening is magical as you are seated in a covered outdoor area, watching the sunset. Preceding the opera are tail gate parties, but these parties are wine and cheese rather than burgers and beer. Often a local professor will give a free lecture about the opera just prior to the performance. Dress code ranges from casual to dressy. Each year I do a Girlie Getaway with my best friend of over 30 years. This year we decided to go hog wild and kill two birds with one stone, covering two of our big bucket list destinations. We found a Gate One two week package at a good rate, leaving in April, which included the highlights of both countries. Our first stop was Delhi where we arrived after a long 16 hour flight from Newark direct to Delhi. Our first full day was spent touring the city including a temple community complex run by the Sikhs. The Sikhs are a warrior class (these are the men who wear turbans and sometimes carry a scabbard). It is their job to protect people. The enormous temple complex we visited was a study in volunteer activity. In every direction were men and women preparing or cooking food. Cooking vats the size of small automobiles were being stirred, Indian breads were popping off a small conveyor belt and fresh vegetables and fruits were being chopped endlessly by men in white and women in brightly colored saris. All were happy to pose for pictures. Outside the temple, truckloads of fresh produce and bags of grain were being unloaded, all sent by anonymous donors. The temple feeds anyone who enters, no matter his or her religious beliefs or station in life. All are welcome. We later visited the home and museum of Gandhi, one of history’s great men, who changed the course of history and culture for India. Gandhi insisted people be treated equally and that the country rid itself of the stigma of the Untouchables. He encouraged better treatment of women and urged his fellow citizens to abstain from drugs and alcohol. And of course he was a key element in throwing off the yoke of British colonialism. The house showed his Spartan bedroom and the actual last few steps he took in the garden before being assassinated by a fellow countryman who did not like the way Gandhi handled the India/Pakistan conflict. Our week in India included the famous Golden Triangle : Delhi, Jaipur and Agra (the city next to the Taj Mahal). Each city was only about 60 miles apart and roads were good but each journey took at least 4 hours of driving with stops along the way due to the fact that the roads go through all the small towns. There are no express city bypass roads. Traveling from city to city was like being on an amusement ride as you watched motorcycles and cars and buses miss colliding with each other, as they passed within inches of each other. Somehow it was worked out and we witnessed no vehicle accidents. The transit times passed rather quickly as our guide often lectured on topics of interest, including arranged marriages, still very common in India. He himself recently wed with an arranged marriage which seemed to suit him fine. He explained that families marry families and divorce rates are low, despite the brief time that the potential bride and groom meet prior to the wedding. Astrology is also a major part of the process including setting the wedding date. The highlight of our visit to Jaipur, the Pink City, was the ride up to the Amber Fort on an elephant. I had ridden an elephant in Thailand, but that time we straddled the elephant. This time it was a sidesaddle ride and I held on for dear life as the elephant loped his way up the mountain, side to side. The only thing keep me from slipping off was a thin metal bar across my waist. I clung so hard my knuckles went white. And in the middle of all this, were the hawkers selling their goods and tossing items up to the tourists. The fort was phenomenal, a labyrinth of hidden dark corridors leading out into beautiful covered open areas where families used to gather to drink tea, socialize and watch the sunset. The city had been painted pink in 1876 to celebrate the visit of the Prince of Wales. 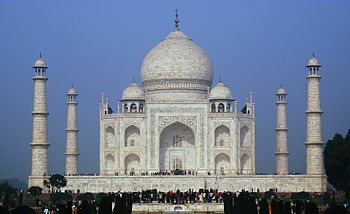 Our final destination was Agra and our much anticipated visit to the Taj Mahal. It was everything we expected and more. Larger than I thought and even more beautiful than its photos, it is also surrounded by smaller, quite lovely temples. We got an early morning start, good for photos as well as avoiding the 100 degrees plus heat. Buses and vehicles are no longer allowed close to the Taj, you park off in the distance and are transferred by little electric vehicles so the Taj does not suffer so much from pollution. Indians are encouraged to visit their country’s famous destinations and temples and have special low entry fees. This is most apparent at the Taj Mahal where Indians of all stations in life were happily playing tourist. Our guide encouraged us to linger at the back of the temple and there we found throngs of people, from all over the world taking pictures of each other. Indians especially are fascinated with blondes and often asked my friend and me to pose for pictures with them. We, in turn, were enchanted with their beautiful saris and dark beauty. It was a photo frenzy full of laughter and joy. We returned to Delhi for one night before flying to Kathmandu on a Friday afternoon. Driving into the city revealed a jumble of buildings with cafes and shops beckoning us. That evening was our first Nepalese meal in a typical local restaurant. The next morning we visited the monkey stupa , then headed out of town and at noon the 7.9 earthquake struck, while we were on the road. The bus slammed on the brakes and bounced up and down and at first I thought we hit a motorcyclist. Then the bus shook side to side and we saw people on the street struggling to keep their balance. Only 50 feet in front of us, the road had heaved upward so we turned around and headed back to the hotel. Our hotel was actually a gated complex, with a conference building and high rise section with guest rooms. We were instructed to sit on the lawn where we soon experienced a second quake as the ground underneath us moved side to side. Everyone was quiet and soon the staff came around with bottled water and saw to every one’s needs. No one was hurt, the hotel was new, built to earthquake specifications, so my friend and I decided we would treat this as an adventure, rather than an ordeal. We joined other members of our group poolside. Somebody had a bottle of rum and the hotel provided coke so we had an earthquake party! A wedding tent was set up for a wedding that day which, of course, was cancelled. The hotel staff tossed out mattresses and blankets and pillows from the first floor guest rooms and set everyone up to sleep in the tent. Pool water was pumped out to the toilets adjoining the pool, a hot meal was provided for us and we all helped clear the debris from the walkaways and pool areas. All our basic needs were met, and so we settled into our “deluxe refugee camp. “ The main negative was that communications were down and we could not reach loved ones for 2 days. The next night the monsoon rains hit and we downgraded our refugee camp to tourist class. We all huddled together in the center of the tent to avoid the rain and winds and soon it became a snoring symphony. The next day we ventured out of the hotel grounds and found 2 nearby tourist stores open. We gave them our headlamps and flashlights and bought whatever we could, which, we were told, would support their families for 2 weeks. On our 4th day we were able to fly to Delhi where we overnighted and enjoyed a hot shower and a celebratory meal before flying home. The Nepalese people were the most kind and caring people I ever met in my world travels. They saw to our needs, worked almost round the clock, despite their personal problems. Their families were safe and brought to the hotel for food and shelter, but many lost their homes. I urge everyone to contribute to rebuilding of the Nepalese tourism infrastructure. More news to follow about that. In late May we flew off to Seattle and rented a car for a one week fly /drive vacation to this beautiful state. Eager to taste those Washington State oysters, we stopped at the Timberhouse Restaurant in Quilcene for lunch, a bit pricey but very good! Our first overnight stop was Olympic National Park where we stayed 2 nights at the family friendly Sol Doc Hot Springs Hotel with bungalows surrounding the main building and hot springs area. You are in the heart of nature at this place. We spent a day driving to the HO area where you can “Hike the Ho” on 3 easy different trails, which take about an hour each depending on how fast you walk and how many photos you take. This is the only rain forest in the continental U.S. and the moss covered trees are a beautiful sight to behold. While on the peninsula, plan or spending some time in, or staying overnight at Port Townsend, a lovely little town at the northern tip of the peninsula. From there we drove to Mt Rainier National Park and headed up the mountain to the Paradise Inn, a charming historic inn and national landmark. Little did we realize that Mt Rainer is the snowiest place in the continental U.S.A. After driving through the sunshine we eventually reached the clouds and the fog-shrouded Paradise Inn. We almost missed the turn off to the parking lot. The inn has an enormous cozy lobby, complete with piano player and a beautiful sunken dining room with views of the mountains on either side. Guest rooms are small but they are renovating many of the wings to accommodate larger rooms. Even in late May, most of the trails feeding off from the lodge were snow covered so we checked out after our one night stay and headed further down the mountain for some hiking. We then headed east to the wine country of Walla Walla, staying with friends and enjoying the wines of Washington State. If you stop in the town, be sure to enjoy lunch at the Olive Marketplace and Café at 21 E. Main St, with a stunning array of delicious fresh foods at reasonable prices. There are many wineries to visit, one of which is called L’École Winery as it was converted from an old schoolhouse. Our final 2 night stay was at the Ace Hotel in Seattle, a quirky interesting property. Located in a trendy neighborhood restaurant area, with relatively reasonable prices, it has one big drawback: Parking is a bear! The local paid parking areas must be vacated by 11:00pm so around 9:30pm, after the restaurant crowd left, we moved our car searching for street parking which is free after 9:00pm. The hotel has no A/C and no private baths, but it is spanky clean with a bank of bathrooms down the hall replenished frequently with fresh towels and high end shampoos, conditioners and body washes. And the major tourist sites are all within walking distance of the hotel. 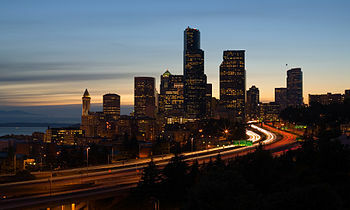 The city of Seattle has so much to offer it is impossible to list it all. We rode up the obligatory Space Needle, checked out Pioneer Square and thoroughly enjoyed exploring Pike’s Market where we had an excellent seafood lunch at Anthonys’ Restaurant. But our last excursion was one of the highlights of our trip: the Boeing plant in Everett, WA, north of the city. If you do not have a car, there are bus companies that offer half day tours at reasonable prices and the guides are very good as they point out the history of Google and Amazon along the drive. The Boeing plant never closes and tours are offered every day of the year, advance reservations recommended. The tour takes a half day with transfers and is well worth it. You are shuttled on a van to the 2 sides of the largest building in the world and then inside you walk on multi- level platforms to see the workers assembling the parts of the various planes. The body of the plane is assembled from 3 parts, plus wings and the tail, which are flown in from all over the world on a special cargo plane called the Dreamlifter. Safety is the number #1 issue here. The highlight of the tour for me, was at the end, when we saw a fully assembled latest version of the Dreamliner. The wings are swept back like eagle wings and they move while in flight to dampen turbulence. The plane was a thing of beauty, and I cannot wait for the opportunity to fly it! After the tour, as our vehicle pulled out of the parking lot, we were thrilled to see a Dreamlifter come in for a landing right in front of us. The landing was perfect but the cargo plane was so heavy it threw up dust from the runway as the tires slammed down on the tarmac. A fitting end to our tour. Nearby is Rifle State Park, popular with rock climbers and the Colorado National Monument, a beautiful drive and worth the short detour west. We ate at the Shooter’s Grill where all the wait staff carry a gun on their hip. Shades of the Wild West! The restaurant offers good food at a reasonable price and is popular with both tourists and locals. 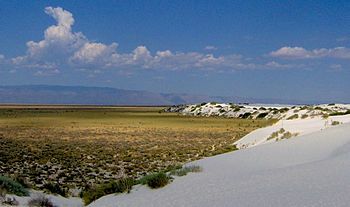 After that we spent the morning driving across the Grand Mesa to Montrose for a 2 night stay. This is a glorious drive, not difficult, with lots of interesting stops. 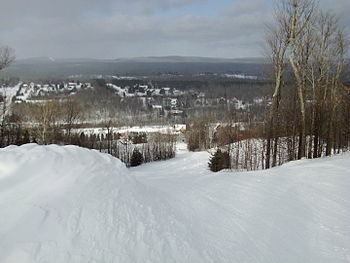 First stop was the Powderhorn Ski Area for a cold lemonade. We learned that the lodge offers a 2 week summer program called Wireless for Warriors that teaches our vets electrical and technical skills that help them get back into the mainstream after defending their country. Many are offered jobs before they finish the course. The expenses are covered by the federal programs for Veterans. Another outstanding stop was in Cedaredge at the Pioneer Town. www.pioneertown.org Allow at least an hour for this excellent attraction. I have visited many historic and pioneer towns but this was tops on my list. Manned by volunteers, the museum and town was built by volunteers as well and the antique items inside the various structures were all donated and consequently the real deal. There is a jail, a small sheriff’s office and yes you can sit at his desk! The bank and the safe looked like something out of the movie “Butch Cassidy and the Sundance Kid.” You can go behind the teller’s window and pretend you are a banker. The saloon has a poker table and old time mirrors plus there is a working creamery, a doll house and a wonderful old doctor’s office with the original medical equipment from over 100 years ago. Be sure to stop in the small towns advertising peaches and cherries as you are now on the Western Slope, where the sweet Palisade peaches are grown. The next day we headed to the nearby Black Canyon of the Gunnison National Park, a scenic and geological wonder. We started off with a 10:00am one hour ranger guided hike along the rim which explained the history and the geology of the area. These free ranger guided hikes are always a great way to get to know the national parks. Next we viewed the film at the Visitor’s Center and learned about how the railroad and the roads and the land was surveyed. Most astonishing was the 2 surveyors who, on their second try down the river in 1901, crashed their remaining boat and decided to jump into the water, and finish the job. They survived and became famous and did complete their survey. After that we spent about 2 hours driving the rim and stopping at all the viewpoints for a short hike and some photos. By early afternoon the sun and heat had wiped us out so we headed back to town for a cold beer and sandwiches at the Horsefly Restaurant on Main St. Another great place to eat on Main Street is the Two Sisters Bistro – outstanding breakfast. On the drive home, we stopped in the cute little town of Palisade which offers a Sunday morning artisan and produce market. We filled up our trunk with fresh fruit and little artisan gifts for family. This is held in June in this historic town and yes it is a gambling town, but the focus is on its historic architecture. The bed race is a carry-over from its history and 2 men push a lady on a bed down Main Street. Everyone is dressed in period clothes and the ladies are dressed like dance hall girls. The entertainment goes on all day and is a fun day trip from Denver, only 45 minutes away. This historic cemetery in the heart of Denver encompasses Colorado’s very early history as well as recent burials. There are ethnic sections plus surveyor sections, nurse sections and if you head over to the oldest section for our military you will find the small gravestone of Silas Soule, the officer who refused to have his unit participate in the Sand Creek Massacre. His gravestone is revered by the Native Americans who often leave flowers and tokens at his grave on the anniversary of this terrible day in our history. LoDo or Lower Downtown is the site of many saloons, brothels and railroad hotels that thrived during the rollicking days of the 1860’s and beyond. This 2 hour walking tour visits those sites that are still standing, albeit transformed into another business, and are still considered haunted. The beautiful Oxford Hotel is one of them and despite its numerous renovations, it has a long history of hauntings. This has become our favorite annual activity in the state of Colorado. Every year from mid-September to mid or late October, the bucks, filled with testosterone, begin bugling in the wee hours of the morning and then descend down the mountains to the meadows where they spend their day defending their harem from the young bucks, or trying to increase it. It is a glorious thrilling event and the panorama that unfolds is different each year. In years past we saw 2 adolescent brothers mustering up the courage to challenge a big bull and then running away when the big bull surged forward. Last year we saw a big bull with a harem of 20 females spending the morning chasing after 2 of his females as they trotted off the get friendly with a young male challenger. When the bull brought the ladies back into the fold, he chastised them, nipping their butts and literally barking at them. Finally, exasperated, he ran across the road, and up the hill to chase after his challenger. We were only about 40 feet from him, next to our car, when he turned and chased. About 20 people were watching roadside, like us, and quickly dispersed or jumped into their cars when the buck ran by. 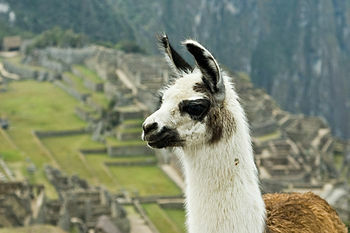 SPT IS GOING BACK TO PERU!!! Finally, we’re headed back to Peru. Dates are July 15-23, 2016. Due to popular demand, we are returning to this outstanding destination and will visit Lima, the Sacred Valley, Machu Picchu, Cusco, and the awesome Lake Titicaca. Special family activities will be arranged. Come join us for a spectacular vacation!